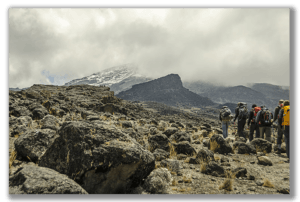 What is the Kilimanjaro Weather Like? One of the unique aspects of any Kilimanjaro climb is that trekkers get to experience five distinct climate zones on their way to the summit of the mountain. Each of those zones offers its own type of weather, which is why is why hikers must be prepared not only for warm, sunny conditions, but also rain, wind, cold, and even snow. At the base of Kilimanjaro is what is known as the Cultivation Zone. This is the region that surrounds the mountain that is mainly used as farmland. It receives plenty of annual rainfall and offers temperate conditions, but for the most part visitors will only be passing through this region on their way to the start of the climb, which begins in the Cloud Forest Zone. Here, conditions can be warm and humid, and it is not uncommon for mists to form under the dense canopy. At times, you’ll even see thick clouds moving overhead just above the treetops. After hiking through the cloud forests, trekkers will emerge from the trees and find themselves in the Moorelands Zone. Here, the dense jungle has given way to tall grasses and giant heathers, leaving climbers more exposed to the wind and rain. Temperatures can remain warm throughout the day, but drop significantly at night, but the humidity begins to drop off and generally it is a more comfortable hiking experience than that found in the cloud forest. Rain tends to be minimal, although precipitation can occur pretty much anywhere on the mountain. Climbing higher still, trekkers will next enter the High Desert Zone, which is arid, with only small, hardy plants managing to survive at an altitude where wind speeds continue to increase and there is little rainfall. Day time temperatures can continue to be quite warm, but in the evening the mercury drops quickly, with conditions often getting much colder. Here, it is not uncommon to be camped well above the clouds, which makes for an enchanting sight. Last, but certainly not least, climbers will reach the Arctic Zone, which starts around 4875 meters (16,000 feet) and continues all the way up to the Uhuru peak summit. Here, temperatures tend to be cold, winds tend to be blustery, and there isn’t much in the way of vegetation. Precipitation is usually at a minimum, but when it does fall it typically comes in the form of snow. Kili’s glaciers are on display here as well and the summit itself is often covered in powder too. While traveling here, you’ll definitely want to bundle up for the final stages of the ascent. Uhuru Peak Summit, the night time temperatures can range between 20 and -20 degrees Fahrenheit (-7 to -29 degrees Celsius). Of course, the weather can vary somewhat based on the time of year that you visit Kilimanjaro as well. For instance, during the months of April and May it is much rainier on the mountain than it is at other times of the year, while January through March it is a bit colder. Those conditions could have an impact on your trek, what you pack for the trip, or even when you decide to go. That said, for the most part, the weather is very stable, fairly predictable, and is simply part of the experience. The long dry season is a great time of year to climb the mountain. Temperatures are slightly colder then the short dry season but overall conditions are excellent with very little chance of precipitation. The “Short Wet” season between October and December is associated the southward migration of the Intertropical Convergence Zone. Rains during the short wet season are much more unpredictable than those that occur during the “Long Wet”. The “Short Dry” can be a good period for trekking especially during late January and into February. Temperatures during this time period are generally warmer than during the “Long Dry”. The “Short Dry” comes to end as the Intertropical Convergence Zone migrates northwards and brings the “Long Wet” season. On the Summit day, You’ll start climbing around midnight, so obviously it will be very cold. You’ll get to the summit known as the Uhuru Peak around the time the sun rises (around 6 a.m. every day of the year) and the sky tends to be clear for a couple hours. Though early mornings are usually clear, there is always snow at the summit so expect very cold temperatures even after the sun rises there.